Thinking about purchasing some new shirts? Now is the perfect time. When you buy 4 shirts, you’ll get your 5th shirt free! We received new stretch fabrics this week that will look great paired with your favorite suit. You can choose from a variety of blues, lavender and a great go-to white. They’re perfect for the fall and for those who love a slimmer cut shirt. Email info@9tailors.com to speak to a style consultant for more information or to schedule an appointment. The promotion applies only to qualifying custom shirts in the C, D, E, and F categories. A la carte design options are still full price. 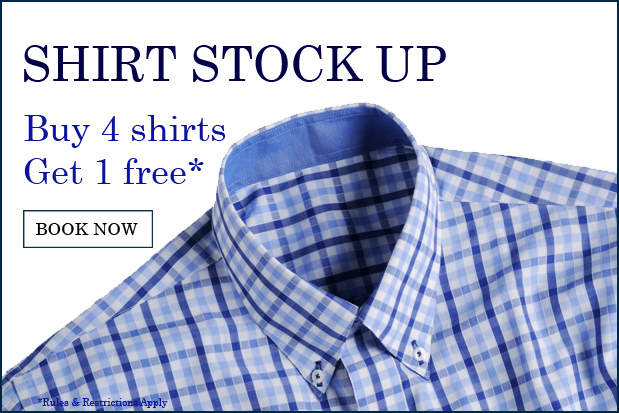 Unless the promotion indicates otherwise, free shirt applies to the lowest-priced qualifying item and may not be combined with other offers. Does not apply to past purchases. Cannot be combined with any other sales or discounts. Shipping and handling charges apply to all promoted items.